What sort of beans do you have? A huge variety, some are not available anywhere else in NZ. The bulk of our collection are common beans (p.vulgaris) which are climbing beans and dwarf beans. These are the focus of The Great Bean Rescue as many of them are old and fresh seed needs to be grown as soon as possible. We also have Broad, Runner, Lima and Yard Long beans in our collection. This depends on the space you have available. Many gardens have enough space for one climber and two dwarf beans. If you have a big garden you may be able to get much more in. We would prefer people grow a smaller number of varieties and collect a larger amount of seed from each than over commit themselves. We would like to save all the varieties so they all need growing - choose a plain looking underdog or choose beans that you like the look of, or ones that sound interesting to you. Growing for seed is an adventure - try something completely new. Do I need to control pollination? Yes and no. Common beans are self fertile and do not require a pollinator however cross pollination can occasionally occur. If you can separate varieties in your garden by a few meters or a tall growing crop then these help to reduce cross contamination. Other types of bean are more prone to out-crossing so only grow one type of runner or broad bean at a time in your garden. Get more information about growing and saving beans from the seed saving pages. How do I plant beans? Beans should be planted in a warm spot after the last of the frosts (October). Push them into loose soil about twice as deep as they are big and cover them over with more soil. Water them well and unless you have very sandy or dry soil you shouldn't need to water them until they sprout. 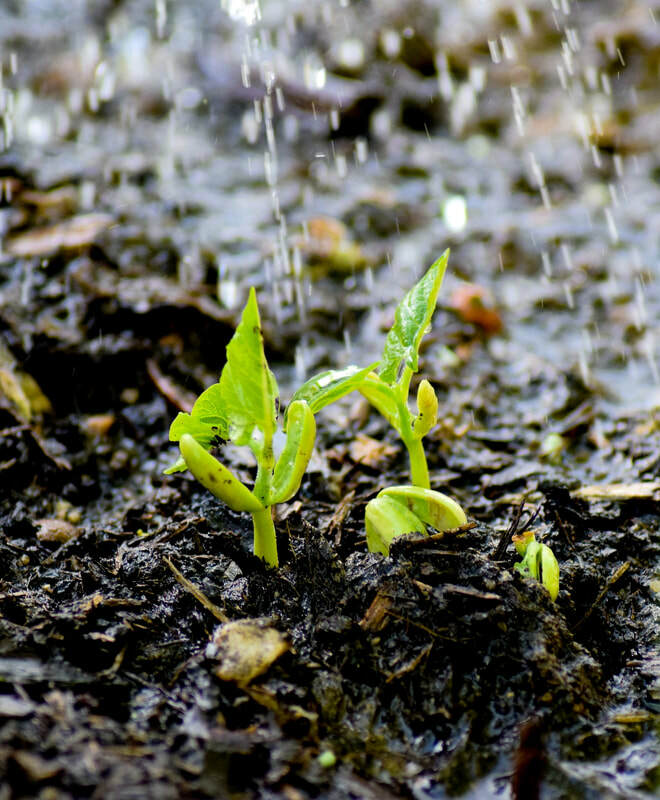 Slugs and snails love new bean sprouts, protect with an iron based pellet such as Quash, use coffee grounds around your seedlings or resort to "digital control". Greasy cutworms, pets, kids and birds can all take their toll on seedlings so protect them from the hazards in your garden. If you are growing a climbing bean these will need support, get you structure in as early as possible - for ideas check out the Bean Structures photo page. Please remember to label your bean varieties at all times. What if they don't grow? Hopefully this hasn't happened and you get at least some of your beans germinating. The less that grow, the more important it is that you save the seeds from that variety. Please let us know on our Bean Rescue Feedback form if you are getting less than 50% germination. Where are these beans from? We were given many of these beans from the Heritage Food Crops Research Trust in Whanganui. Who in 2008 started a big project to look into the health properties of heritage beans. They collected beans from around NZ and imported a number of heritage beans from the USA and Mexico. Some of the other beans in our collection have been donated by local seed savers and gardeners. After the HFCRT bean project wound up, some of the beans were distributed to different organisations around NZ but many of them languished. Nelson Seed Library acquired this bean collection in early 2017 and is attempting to refresh and renew as much of the seed as possible. Once the beans are returned to us in 2018 they will continue to be available to the Nelson public and we will also share some with other organisations around NZ. What does viability mean, why is it important? Seeds are alive, they contain all the energy required for it to grow to a seedling that can support itself. When bean seeds are dried they become dormant, that is the breathing and energy use is reduced to a minimum. Beans can last this way for many years if kept in the right conditions (cool, dark and dry). As the seeds get older or if conditions aren't ideal then they begin to lose viability, that is the percentage that germinate gets lower. Please let us know if you think a variety you are growing has less than a 50% germination rate. Survival of a variety depends on enough seeds being saved each generation, to save the genetic material for the next generation. As seeds lose viability the quality of genetic information they contain is sometimes compromised. How much seed should I save? For The Great Bean Rescue, we hope that you will save as many as you can, that doesn't mean you can't taste a few along the way but the main purpose of this grow out is to preserve the varieties available. If we have lots and lots of a given bean returned to us then we will share that variety with other seed savers around the country - unique varieties can be used as swaps to increase our collection at Nelson Seed Library. In general when saving seed for the Nelson Seed Library aim to fill a jar, a big jar (300ml) for big seeds and a small jar (50ml) for small seeds. For seed that is finer than a tomato a half full small jar is sufficient. Yes. You most certainly can. For this project the biggest thing is to get as many people growing beans as we can manage. Talk to family/friends/neighbors and get them on board. Connect with us on Facebook and help share the word on social media. The Nelson Seed Library is run by a small group of volunteers, if you are interested in contributing send us an email. We also have a group of keen growers known as Seed Guardians - people who are particularly interested in saving seed are invited to join this group. Do I need to record information? It is imperative that the variety name or Nelson Seed Library seed number (e.g. 0234) stays with the seed you take to grow, keep the plants labeled right through their growth cycle and back to seed again. For The Great Bean Rescue we are also hoping to collect more information on our beans. You can fill in the form on the back of the bean rescue brochure or keep a record and fill in the details on the seed questionnaire on the website. Can I contribute a new bean to the collection? Absolutely! We are always happy to receive new seeds to share with the public. If you can give us some history or other information about the seeds you are donating that would be fantastic. We also need enough to share so we would really like it if you could donate a jar full (or more) rather than just a few. For more information check out our seed donations page.